Our guest last night on Stache Radio was the Wall Street Journal New York Mets beat writer Jared Diamond (@JaredDiamond). We took a look back at the first half and look ahead to the second half of the season. Along with taking a look at the upcoming Trade Deadline, we also discussed the young pitchers innings limits, Daniel Murphy, and took twitter questions. Last night we were lucky enough to be joined by Jake and Jordan of Cespedesfamilybarbecue.com (@CespedesBBQ), to talk about everything baseball related. We covered everything from how the BBQ got started, to best/worst minor league stadiums they have been to, favorite random players, “rig”, the Seattle Mariners, New York Mets, Baltimore Orioles, and what Bartolo Colon’s belly feels like. On last night’s episode of TSB Radio, Earl (@EarlTSB), Jon (@JonPresser), and Matt (Dailystache) talked about NBA free agency, LeBron James, Carmelo Anthony, potential Kevin Love trade rumors, the New York Yankees and Masahiro Tanaka’s elbow injury, New York Mets, MLB and much more. Last night on Stache Radio Matt, Earl and Jon had the opportunity to talk to the one and only Adam Rubin of ESPNNY.com. Travis d’Arnaud, Chris Young, Daniel Murphy, Sandy Alderson, what is it like covering the team, and the potential future lineups for the Mets. In case you missed it, last night the guys were on TSB Radio and talked about a variety of different topics. They started off by talking about Bartolo Colon and his fantastic accomplishment yesterday, the World Cup, the New York Rangers loss in the Stanley Cup Finals, NBA Finals, and ketchup on hotdogs with @xTomatoez. Last night Earl and Matt talked about the NBA Finals, the New York Mets and Yankees, the Stanley Cup Final, and Colin Kaepernick’s new record setting 6 year contract extension. Last night on TSB Radio, Earl, Matt, and John started off the show with some New York Mets talk. Specifically about Bartolo Colon pitching at home/not in little league parks. After the Mets stuff, they got into the NBA playoffs and then the NHL playoffs. @Midnightbashem then capped the night off with his thoughts on the Mets and Rangers. Last night the guys had a ton of stuff to talk about regarding the New York Mets. After the Mets 5-3 loss to the Pittsburg Pirates on Monday, General Manager Sandy Alderson released reliever Jose Vaverde and fired hitting coach Dave Hudgens. Top pitching prospect Noah Syndergaard was on his way to New York to have his elbow examined by team doctors. They covered those topics and more, along with taking calls from @BlueChill123 and @MetsKevin11. The New York Mets are a dumpster fire, Derek Jeter is getting gifts from teams he’s only played 7 career games against, and the NHL and NBA conference finals are underway. Matt and Earl went around the horn touching on these topics and more. 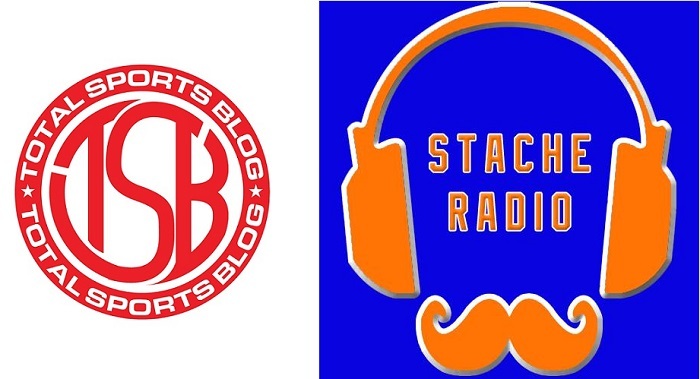 Our New York Mets podcast Stache Radio, was back after a ten game hiatus. Kevin made his return to the air waves with Earl, Jon, and Matt, as they hit on a bunch of topics. The topics included: If Terry Collins was fired, who should replace him? Rafael Montero and Jacob deGrom’s major league debuts. What did everyone make of the #FreeLagares movement? And a recap of the last 10 games/preview of the next 3 series. Special thanks to a first time caller, long time listener @BlueChill1123 for checking in with us.